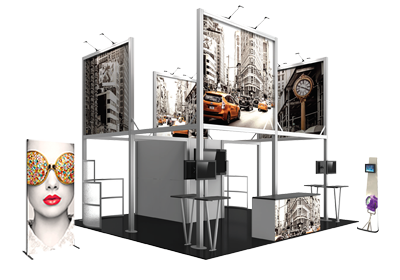 Hybrid Pro™ Modular Kit 28 is a contemporary and angular modular exhibit. The backwall encompasses five fabric backwalls - three tubular angular shaped backwalls (center and sides) and two extrusion based backwalls. Graphics are a combination of push-fit SEG fabric and pillowcase stretch fabric. Six shelves are built into the backwall to help you show and demonstrate small product. Create a dynamic feel with superior graphics on this modular inline display.